The Family Inventory of Life Events and Changes (FILE) was developed as an index of family stress by Hamilton McCubbin, Joan Patterson, and Lance Wilson (1983) and assesses the pile-up of life events experienced by a family (the AA factor of the Resiliency Model). The concept of life stress has received increased attention in both the media and scientific literature. Stress, as conceptualized here, derives from two bodies of scientific literature, namely, psychobiological stress research and family stress theory. In the last 25 years, there has been a proliferation of research based on the hypothesis that stress, arising from an accumulation of life events, plays a role in the etiology of various somatic and psychiatric disorders. This concept of cumulative life changes has not been applied in a systematic manner to the study of family behavior in response to stress. The Adolescent-Family Inventory of Life Events and Changes A­-FILE, developed by Hamilton McCubbin, Joan Patterson, Edward Bauman, and Linda Harris (1981), is designed to measure an adolescent's perspective on family system and individual life events and changes as a critical factor in explaining both vulnerability and resiliency in adolescents and young adults. The Young Adult Family Inventory of Life Events and Strains (YA¬FILES), developed by Hamilton McCubbin, Joan Patterson and Janet Grochowski (1984), is designed to assess the life strains and changes impacting on young adults transitioning to college life. YA-FILES is a modification of Adolescent-Family Inventory of Life Events and Changes (A-FILE) developed and tested by H.I. McCubbin, Patterson, Bauman, and Harris (H.I. McCubbin & Patter¬son, 1981c) to assess adolescent stress. The Family Pressures Scale Ethnic (FPRES-E) was developed by Hamilton McCubbin, Anne Thompson, and Kelly Elvêr (1993b) as an adaptation of the Family Inventory of Life Events (FILE). FPRES-E was specifically adapted to be inclusive of pressures related to the life experience of families of color and to obtain an index of the severity of the pressure in the family system. The Family Hardiness Index (FHI) was developed by Marilyn McCubbin, Hamilton McCubbin, and Anne Thompson (1986) to measure the characteristic of hardiness as a stress resistance and adaptation resource in families which would function as a buffer or mediating factor in mitigating the effects of stressors and demands, and a facilitation of family resiliency adjustment and adaptation over time. Family hardiness specifically refers to the internal strengths and durability of the family unit and is characterized by a sense of control over the outcomes of life events and hardships, a view of change as beneficial and growth producing, and an active rather than passive orientation in adjusting to and managing stressful situations. In an attempt to assess the family's repertoire of resources, the Family Inventory of Resources for Management (FIRM) was devel¬oped by Hamilton McCubbin, Joan Comeau, and Jo Harkins (1981). In order to describe or predict how a family adapts to stressful events, the Resiliency Model of Family Stress, Adjustment, and Adaptation calls for information about which resources a family has, does not have, or has depleted. It is hypothesized that fami¬lies possessing a larger repertoire of resources will manage more effectively and will be able to adapt better to stressful situations. Along with the social-psychological resources assessed by FIRM, the clinician or research investigator should consider two socio¬demographic resources: family income and the parents' education. The Family Time and Routines Index (FTRI) was developed by Hamilton McCubbin, Marilyn McCubbin, and Anne Thompson (1986) to assess the type of activities and routines families use and maintain and the value they place upon these practices. Family time together and routines they adopt and practice are relatively reliable indices of family integration and stability which include effective ways of meeting common problems and the ability to handle major crises. 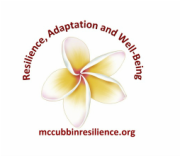 The Family Traditions Scale (FTS) was developed by Hamilton McCubbin and Anne Thompson (1986b) to study the role of family resistance resources in providing resiliency and stability of family life in the face of adversity. As resistance resources and adaptation resources, family traditions are important to family life, particularly in the face of adversity. Family traditions are those events, activities and practices that families have done in the past, which they are likely to continue to do and which they value and/or respect. Example Items: "This is a tradition in our family"
The Family Celebrations Index (FCELEBI), developed by Hamilton McCubbin and Anne Thompson (1986a), is designed to assess the scope and depth of celebrations in families; activities which give meaning and value to family life. Celebrations are those special events (i.e., birthdays, Mother's Day, graduations, promotions, etc.) which are marked by the family in a particular way. The Young Adult Social Support Index (YA-SSI) instrument was developed by Hamilton McCubbin, Joan Patterson, and Janet Grochowski (1984) as an adaptation of the Social Support Inven­tory (SSI) developed by Hamilton McCubbin, Joan Patterson, Betty Cooke, and Marilyn Rossman (1983) to assess the social support of entering college age youth in the college community. The Coping Health Inventory for Parents (CHIP) was developed by Hamilton McCubbin, Marilyn McCubbin, Robert Nevin, and Elizabeth Cauble (1981). It was developed to assess parents' appraisal of their coping responses to the management of family life when they have a child member who is seriously and/or chronically ill. The instrument is available in English and Spanish. In order to describe or predict how a family adapts under a chronic stress situation, the Resiliency Model of Family Stress, Adjustment and Adaptation calls for information about coping behaviors. The Family Crisis Oriented Personal Evaluation Scales (F-COPES), developed by Hamilton McCubbin, David Olson, and Andrea Larsen (1981), was created to identify problem solving and behavioral strategies utilized by families in difficult or problematic situations. FCOPES draws upon the coping dimensions of the Resiliency Model of Family Adjustment and Adaptation in which the following factors are integrated: pile-up, family resources, and meaning/perception. The instrument features 30 coping behavior items which focus on the two levels of interaction outlined in the Resiliency Model: (1) Individual to family system, or the ways a family internally handles difficulties and problems between its members; and (2) Family to social environment, or the ways in which the family externally handles problems or demands that emerge outside its boundaries, but affect the family unit and its members. It was hypothesized that families operating with more coping behaviors focused on both levels of interaction will adapt to stressful situations more successfully. The Family Coping Index (FAMCI) was developed by Hamilton McCubbin, Anne Thompson, and Kelly Elver (1995b) to assess family coping efforts of families of youth at risk, youth offenders and youth in residential treatment programs. Given the importance of family coping as a viable target for intervention, the goal was to develop a measure which would be ethnically sensitive and particularly applicable to the families of both Caucasian and African­ American youth. The Adolescent-Coping Orientation for Problem Experiences (A-COPE), developed by Joan Patterson and Hamilton McCubbin (1983a), is a coping inventory which has been designed to identify the behaviors adolescents find helpful in managing problems or difficult situations. The normal developmental tasks of adolescents’ center on the search for identity, both as part of a group and as individuals, with attention focused on physical, social and psychological aspects of the self. The need to develop enough independence from one's family to discover one's separateness and uniqueness frequently creates an atmosphere of conflict in the family. The often touted storm and stress of adolescence in American culture is a reality for many adolescents. In the critical transitional period from childhood to young adulthood, adolescents struggle with staying con¬nected to and dependent on their families, while also trying to exercise their growing need for independence. This pull between being connected to and being separate from one's family underlies adolescent coping behavior. The Youth Coping Index (YCI) was developed by Hamilton McCubbin, Anne Thompson, and Kelly Elver (1995c) specifically for the study of African-American youth in residential treatment. Given the importance of youth coping as a viable target for intervention, the goal was to develop a measure which would be ethnically sensitive but applicable to both Caucasian and African-American youth. English The Young Adult Coping Orientation for Problem Experiences (YA¬COPE), developed by Joan Patterson, Hamilton McCubbin, and Janet Grochowski (1983), represents a modification of Adolescent-Coping Orientation for Problem Experiences (A-COPE) to identify the behaviors that adolescents found helpful in managing problems or difficult situations. English The Family Coping Inventory (FCI) was developed by Hamilton McCubbin, Pauline Boss, Lance Wilson, and Barbara Dahl (1981) to assess how spouses appraise their overall responses to a family separation which is permanent (e.g., divorce), for an extended period (e.g., military assignments), or recurs repeatedly (e.g., corporate executive). The Family Problem Solving Communication (FPSC) Index was developed by Marilyn McCubbin, Hamilton McCubbin, and Anne Thompson (1988) to assess the two dominant patterns in family communication that appear to play an important part in family coping with hardships and life catastrophes. Recognizing that all families have both positive and negative patterns of communication, the need for a measure to assess both patterns as important factors in family problem solving and resiliency was apparent. The Dual Employed Coping Scales (DECS) was developed by Denise Skinner and Hamilton McCubbin (1981) in an attempt to identify the coping behaviors spouses find helpful in managing work and family roles when both partners are employed outside the home. The successful management of the dual-employed lifestyle seems to call for an orchestrated response with family members employing a variety of coping behaviors. DECS is an attempt to more adequately and systematically assess such families' adaptation to the stresses of dual· employed living by identifying and measuring the coping behaviors these families utilize. The Family Coping Coherence Index (FCCI) was developed by Hamilton McCubbin, Andrea Larsen and David Olson (1982a) in an effort to identify a subscale of family coping which related to Aaron Antonovsky’s (1978) concept of a sense of coherence, which families call upon to manage life changes and stresses. English The Family Schema-Ethnic (FSCH-E) Index was developed by Hamilton McCubbin, Anne Thompson, Kelly Elver, and Kera Carpenter (1992) to measure the degree to which a family has cultivated a family schema, a world view which is inclusive of cultural and ethnic values, and which is an important part of the family's identity. Family schema is a generalized structure of shared values, beliefs, goals, expectations and priorities, shaped and adopted by the family unit, thus formulating a generalized informational structure against and through which information and experiences are compared, sifted, and processed. . A family schema evolves over time and serves as a dispositional world view and framework for families to evaluate crisis situations and legitimate adherence to change in, and affirmation of the family's established patterns of functioning, problem solving, and coping responses. While fostering family problem solving and coping, and its established patterns of functioning and family paradigms for functioning (see Chapter 1), the family schema has as one of its central functions the development of family meanings. This aspect of family appraisal involves the creation of family stories or understandings shared by family members for the purpose of facilitating the family's adaptation in the crisis situation which calls for changes in the family's established patterns of functioning. These meanings transcend the immediate stressor and the situation and place the crisis in a larger context of experiences. From this perspective, the family schema facilitates the development of meaning through the processes of: classification (framing the situation in terms of shared values and expectations), spiritualization (framing the situation in context of the family's shared beliefs), temporalization (framing the situation in terms of the long view and long-term consequences as well as the positive aspects of the present), and contextualization (framing the situation in terms of nature and its order of things, as well as the community and personal relationships and the interpersonal order of things). The Family Attachment and Changeability Index 8 (FACI8) was adapted by Hamilton McCubbin, Anne Thompson, and. Kelly Elver (1995a) specifically for the study of African-American youth in residential treatment and their families. Families and youth create for themselves specific and predictable styles of functioning which can be measured and identified. These patterns have predictive power in explaining which adolescents and young adults are most likely to respond to residential care and succeed in post-treatment living situations. The goal was to develop a measure which would be ethnically sensitive but applicable to both Caucasian and African-American youth and their families. The Family Member Well-being (FMWB) Index was developed, by Hamilton McCubbin and Joan Patterson (l982e), to measure the degree to which a family member is adjusted in terms of concern about health, tension, energy, cheerfulness, fear, anger, sadness and general concern. In an effort to develop a broadly defined measure of family maladaptation the Family Distress Index (FDI) was developed by Hamilton McCubbin, Anne Thompson, and Kelly Elver (1993a) to obtain family self report observations as to the occurrence of family hardships (e.g., drug abuse, divorce, emotional problems) and challenges which reflect family disharmony and family intolerance. The severity of the distress is recorded by the family members completing the questionnaire. This measure was one index of family outcomes in the Resiliency Model of Family Stress, Adjustment and Adaptation. The Organizational Climate Scale (OCS) was developed by Anne Thompson and Hamilton McCubbin (1989). It was developed to assess the problem solving and communication patterns of individuals in the workplace that are sensitive to organizational change. The Family Index of Regenerativity and Adaptation-General (FIRA-G) was developed by Hamilton McCubbin (1987a) to provide a brief set of measures which have reliability and validity and can be used to test the major dimensions of the Resiliency Model of Family Stress, Adjustment and Adaptation. The use of self-report family systems assessment measures in research, education, and clinical counseling work, and particularly family health research is based on the premise that family processes interact with individual family members' psychological and physiological processes in discernible and predictable ways. Clearly, the family system is but one of a host of interrelated environmental influences which can and does have a profound impact upon individual family members, but the research to substantiate this relationship 1s in an embryonic stage of development. The jury remains in session deliberating the merits of current research. Until such research has been accumulated to guide family life education programs and family oriented clinical and health focused interventions, the training of family educators, nurses, social workers and physicians will continue to be guided by faith, experience, clinical insights and unconfirmed assumptions. To advance research to address these educational and clinical issues about the family system, family assessment measures have been developed and tested. The Family Index of Regenerativity and Adaptation for Military Families (FIRA-M) was developed by Hamilton McCubbin (1987b). The use of self-report family systems assessment measures in military family research is based on the premise that family processes interact with the military community as well as individual family members' psychological and physiological processes in discernible and predictable ways. Clearly, the military system is but one of a host of interrelated environmental influences which can and does have a profound impact upon the military member and other family members, as well as the military member's job performance. But the research to substantiate these relationships is in an embryonic state of development. The jury remains in sesion deliberating the merits and generalizability of past as well as current research. Until such research has been accumulated to guide family life education programs and family oriented clinical and health focused interventions, the training of family educators, nurses, social workers, ministers, outreach specialists and physicians serving the military community and families within will continue to be guided by faith, experience, clinical insights and unconfirmed assumptions. To advance research to address these educational and clinical issues about the military family system, family assessment measures have been developed and tested. This chapter is devoted to sharing current information about family assessment, particularly as it relates to the Resiliency Model of Family Stress, Adjustment and Adaptation as it applies to military families.